Microsoft MVP Waldo's blog about Microsoft Dynamics NAV and Dynamics 365 Business Central. Microsoft Dynamics 365 Business Central – 2019 Spring Release is released! I recently got an email from a very dedicated support engineer from Microsoft that probably most of you know (at least if you use Microsoft Support): Zeeshan Mehdi. He pointed out there is a new, useful link on Partnersource. 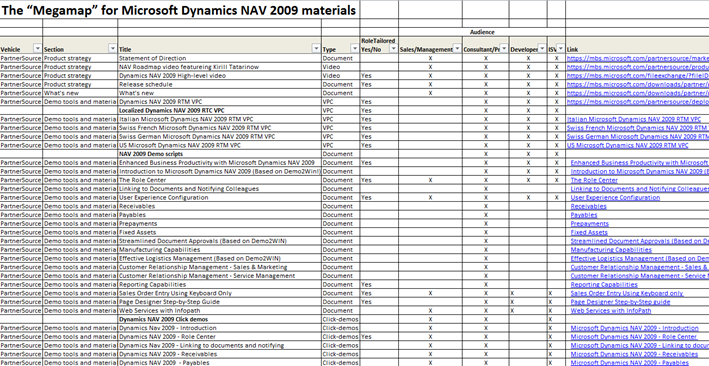 In fact, it's a link to a download that contains .. other links :-): a "MegaMap" to Dynamics NAV 2009 Materials. A total of about 230 links to various sources on Partnersource and MSDN. Useful? I definitely think so! Why Excel? Probably because you can easily search and filter to get where you want.. . Copyright 1995-2019 Dynamics User Group, all rights reserved.